DC Direct's first Arrow action figure release was a two-pack of Oliver Queen and Deathstroke, but there was a problem with that: Oliver Queen may have been Oliver Queen, but Deathstroke wasn't Deathstroke. The set was based on Season 1, and the only guy in Season 1 to ever wear an orange and black mask was Slade Wilson's ex-partner, Wintergreen. Sure, we fans assumed the guy in the mask was Deathstroke, but as you know, the show likes to play with expectations. Deathstroke did eventually appear, but it wasn't until Season 2, and he didn't look like that figure. Hardened by his years as an agent for ASIS, Slade Wilson is a soldier with a clear-eyed view of human nature and a special fondness for swordplay. Four years ago, Slade came to Lian Yu on a secret mission only to wind up abandoned on the island, disavowed by his government and assumed dead by his wife and child back home. Despite the brutal conditions on the island, Slade manages to survive until a naive Oliver stumbles into his life. Initially dismissibe of the wealthy castaway, Slade soon realizes Oliver could be his ticket off Lian Yu, and starts to train him to be a warrior in the hopes of finally returning home. As the two men battle the evil elements on the island, Slades develops a parental bond with Oliver. But as Oliver comes into his own, Slade's bond with him starts to unravel, resulting in tragic consequences for both of them. 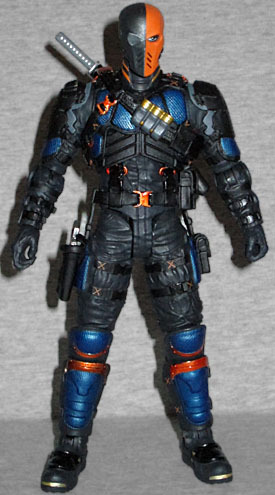 TV Deathstroke's costume doesn't look exactly like his comicbook costume, but it does look a lot like the outfit he wears in Arkham Origins, so depending on how forgiving you are, this toy could fit in multiple collections. It was sculpted by Gentle Giant Studios, and if you really get in there and examine the details, you'll see that the base of this outfit is the same as what the last figure was wearing: a simple black jumpsuit under an armored vest with diagonal pads to protect the chest. It's just hard to recognize it, because he's now topping that with new metallic blue armor - shin guards, kneepads, thigh plates, studded knuckles, combination forearm/elbow pads, pauldrons, and plates over the chest and back. 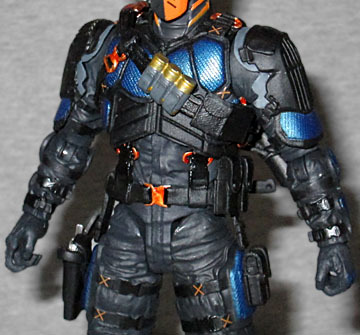 To complete Slade's usual colorsheme, there are metallic orange accents - mainly all the buckles that hold his suit together, but also by his knees and neck. Gone is the cloth(?) mask Deathstroke used to wear, replaced by a much more tactical piece. This is clearly something solid and inflexible, whether it's plastic, carbon fiber, metal, or just fiberglass (like a hockey mask). The right eye is fully covered, since he doesn't need to look through it anyway, and there are slits on the front for air. A knotted tassel pokes out the back, keeping the illusion of a mask that's been tied on. Deathstroke may be a superb unarmed fighter, but he still comes with a nice assortment of weapons. There's a katana, a large tactical knife, a smaller knife, and a silver Desert Eagle pistol. All four weapons can be stored on the figure when not in use: there's a holster on his right hip, a scabbard on his back, and sheathes on his left boot and the back of his belt. He also has grenades strapped to his chest, and several bullets over his shoulder. 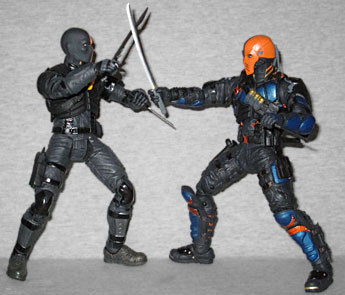 The articulation is mostly the same as the prior "Deathstroke" figure, with a balljointed head and chest, swivel/hinge shoulders, elbows and wrists, H-hips, double-hinged knees, and swivel/hinge ankles. The only things missing are the swivel biceps and thighs, which is a little bit disappointing - the elbows almost make up for the biceps - but it's nothing so terrible as to make you avoid this figure. The wrists flex back easier than they flex in, and the armor on the shoulders impedes those a little bit, but this is mostly an above-average offering. Arrow's version of Deathstroke is sinister and frightening in a way the comics' version hadn't been in years, so getting a toy of him is very welcome!